Click on the photos below to go to the box.net website and see videos of Halifax Midland. When you are taking to the box.net site click on the link to download the video clips. The music (The Triumphal March from Aida by Verdi, Handel's Messiah and a Tchaikovsky piano concerto) is intended to reflect the confident nature of the railways in the 1920s and, of course, top disguise the un-prototypical sounds of the locomotive's motor! 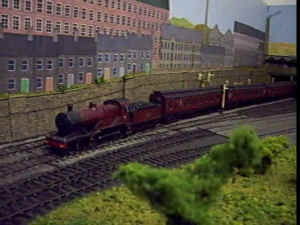 The first video shows a Midland Compound leaving on an pasenger train and a 4F 0-6-0 arriving on a freight train. 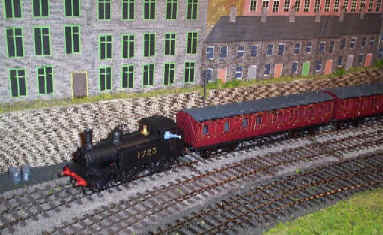 This is followed by a 0-4-4T arriving on a local train. This video was taken before the track layout was altered, hence the apparent wrong line running of the trains. This third video shows No 483 leaving on a train of express clerestory coaches bound for St. Pancras. As the train leaves it passes a 4F at the head of a goods train standing on the new goods lines and waiting to follow the express into the tunnels at the station approach. This fourth video shows No 1725 Halifax's station pilot loco pulling a rake of arc roof suburban coaches out of the station. The music accompanying the video is, of course, "Jerusalem" with its reference to dark satanic mills, something which was very obvious in Halifax in the 1920s.